"Spectacular panoramic maps of our amazing planet"
"Sensational fold outs of the continents and oceans"
"Zoom over continents, swoop over the oceans and hover over mountains!" "Ordinary maps show you where places are, but imagine you could fly above the earths surface and see it for yourself. This extraordinary book allows you to do just that. It uses new computer technology to create spectacular panoramic maps of the Earth's incredible physical features." These were just some of the accolades and testimonials for our work on this remarkable atlas. 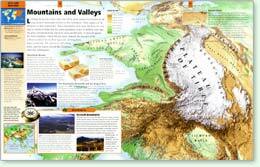 This whole atlas is built around the panoramic terrain visualisations of Alan Collinson Design / Geo-Innovations. The atlas also engaged our editoral staff who sourced, compiled and drew the world climate types, rainfall and temperature maps.